Back in October I thought that I would die a happy man if I never had to hear another album of female harmonic folk ever again; as I was being bombarded with Sisters, Cousins, friends and lovers all singing the same twee songs over and over again. OK I’m exaggerating; but you can’t squeeze a fag paper between the Pierces, Secrets, Chapin’s and (my actual favourites) the Bowman’s et al. 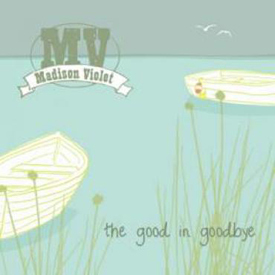 But sitting here today Madison Violet has suddenly appeared like a ray of sunshine on a rainy day. Les Cooper’s production is as smooth as a baby’s bottom and you can hear every palpitation in the girl’s voices and every note from their all-star backing band and the harmonies…..well; they are to die for! For once a female duo actually has a range to their songs and the songs themselves are all well crafted and memorable – a trick very few others have managed this year. Colour in Grey sent my legs to mush as the girls sound like warm honey as they tell a broken-hearted tale over some beautiful bottle neck guitar. Then of course there is the heartfelt Come As You Are which starts with a Neil Young influenced harmonica before either Brenley or Lisa (I don’t know who) pours her heart out as she sees the end to a relationship approaching all too clearly. The album is book-ended by two wonderful songs that will both go into my Top 100 on my MP3 – opener If I Could Love You starts with some quiet piano that leads into a beautiful song about a dying relationship that just oozes Radio play. Then there is the album closer – Christy Ellen Francis. I’d been playing the CD in the car and was obviously enjoying it until this final track hit me like a brick. It’s that good I had to play it 5 times in succession and by the end I had tears in my eyes. What’s so good about it you ask? I don’t really know, but Christy Ellen Francis is a 100 year old widowed Mother of 16 and the song is a love song from an adoring Grandchild and is simply beautiful.